The ever-useful chronograph has served everyone from the stylish watch enthusiast to the technically savvy pilot. 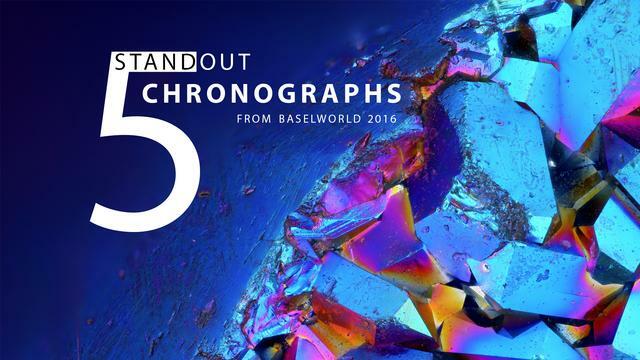 Here, iW has compiled five of the most memorable chronographs from Baselworld 2016. Continue reading for more on timepieces from brands like Breitling, Omega, Rolex, TAG Heuer and Bulova. Rolex’s Oyster Perpetual Cosmograph Daytona was initially introduced in 1963 and was meant for professional racing drivers. At Baselworld, the watchmaker released a new model in 940L steel with a monobloc Cerachrom bezel, developed and patented by Rolex. This model is akin to the 1965 model thatwas fitted with a black Plexiglas bezel insert. The Cosmograph Daytona is equipped with calibre 4130, a self-winding mechanical chronograph movement entirely made in-house. Its architecture, a composite of Rolex technology, was completely re-engineered: the number of components for the chronograph function was reduced significantly, enhancing its reliability. Calibre 4130 is equipped with aself-winding module featuring a Perpetual rotor and offers a power reserve of approximately 72 hours. This groundbreaking watch wraps a chronograph around the top of your wrist. The Bulova CURV is fitted with what appears to be the first-ever curved chronograph movement, CURV features a tricked-out version of Bulova’s proprietary high-speed quartz caliber with enhanced accuracy and sweep-second hand. The watch slims and, yes, curves the typical sports watch profile so that it’s surprisingly sleek and form fitting when on the wrist. The twelve-piece CURV collection comes in a variety of styles, but my favorites are the steel and titanium-cased models that show off the unusual movement in a display that features the famed Bulova Accutron logo. The original Omega CK2998 was released in 1959 and has since become one of the most sought-after vintage Speedmasters in the world. Today, Omega has used this classic model as inspiration for the new Speedmaster “CK2998” Limited Edition – an updated model for a new generation of fans. The Calibre 1861 was the iconic movement used in the very first Moonwatch. For this model, the watchmaker has retained the same movement to offer a true sense of authenticity. Due to its rarity, only 2,998 of these collectable watches have been produced. In a rare move, the original Speedmaster Seahorse medallion has been reintroduced and embossed on the screw-in caseback. With its the historic TAG Heuer logo on the dial to remind one of the Monza’s revered place in the manufacture's historic 40-year-old collection, this updated cushion-cased classic is all black with black and white lacquered hour and minute hands, all like the 1970s original. But this new edition, the Heuer Monza Chronograph adds orange SuperLuminova indices and a grade 5 titanium (previously steel) case coated with titanium carbide. The diameter has also been increased (from 39mm on the original models to 42mm). The watch is equipped with a racing strap in full-grain black calfskin with top-stitching, which evokes the design of the three-spoke steering wheel on the racing cars of the time. Inside, the Caliber 17 automatic chronograph, with two counters at 3 o'clock and 9 o'clock – evokes even more retro pleasure. Its stature, its material, as well as its 24-hour indication combine to make the new Avenger Hurricane a truly standout model. Featuring a 50 mm XXL diameter, a sturdy construction equipped with lateral reinforcements and an all-black technical look enhanced by yellow accents and aviation-inspired stencil-type numerals, it is designed to share every challenge. This instrument for professionals is a compendium of boldness, innovation and performance. The Avenger Hurricane case is entirely made out of Breitlight®. This high-tech material exclusive to Breitling boasts a number of functional qualities. It is anti-magnetic, stable in respect to thermal variations and above all ultra-resistant to scratches, traction and corrosion. As a crowning touch, it is 3.3 times lighter than titanium and 5.8 times lighter than steel.